This article is based on Sirisena Coorays memoirs of his four decade long relationship with Ranasinghe Premadasa, "Premadasa and I: Our Story, scheduled to be released on the 23rd of June, 2002, on the occasion of the late Presidents 78th Birth Anniversary. After the reconciliation with Mr. Jayewardene in 1973 we started working for the party full time. Mr. Jayewardene launched a nation-wide propaganda campaign; he would go round the country taking one route and we, the Premadasa group would take another route. Mr. Premadasa wanted to build a village base for the UNP. He was appealing to the people and people accepted him as one of their own. The UNP never had a base in down South: it was he who changed that because Southerners accepted him as their man. At the same time people in other parts of the country did not feel that he was an outsider either. His appeal was a national one. 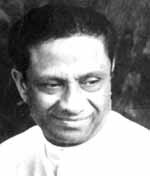 Mr. Premadasas conception of development was different from that of Mr. Jayewardene and his team. For example he used to say: "We have spent so much money on the Free Trade Zones. We should have used this money to improve the condition of the tea estates". He also felt that after D. S. Senanayake, the successive leaders followed an urban entered policy; as a result our villages have been neglected for decades. There was no national policy for rural development. Mr. Premadasa also believed that the benefits of the Mahaweli project should have been generalized more and that all the small tanks in the dry zone should have been developed as a part of this programme. Mr. Premadasa understood that the economic policies of the post 77 government benefited only a fraction of society - the business people, the commission agents and the Colombo elite. He was born and bred among the poor and the downtrodden; he also worked for and with them. So he understood the problem of poverty very well. He was seriously concerned about the growing disparities. He felt that the growth that took place during this period by-passed the poor people. He believed that the problem was one of wealth distribution. He wanted to improve the quality of life of the people. With his Housing Programme he was trying to ensure that the poor people had access to the basic necessities of life, such as the ownership of a house. Mr. Premadasa had his own very diffident approach to developmental issues; his notion of slum clearance is an example of this. Usually slum clearance means the forcible eviction of the people living in slums to areas outside the city and developing these city locations for commercial purposes. You can see this happening now. This is both a political mistake and a human tragedy. Most of those people would have been living in that area for a long time. They work close by; their children go to nearby schools. If you uproot them from that environment and put them elsewhere they feel alienated. Their work, education and social life get disrupted. What Mr. Premadasa meant by slum clearance was improving the quality of life of slum dwellers by providing them with better housing and other basic facilities. That eventually became the official government policy. Only a very few people were removed outside their original habitats and that too was not done forcibly. We obtained their consent. (That was not from Colombo Central; it was done under the Canal Development Scheme. We took these families to Badowita, in Ratmalana. They are doing well now). Mr. Premadasa told me that he was going to ask the IPKF to leave. It was one of his main election pledges. In fact during the Presidential and Parliamentary elections both the UNP and the SLFP pledged to send off the IPKF. A major reason for this rare policy consensus was because the removal of the IPKF was a common demand of all the major groups in society. Therefore both major parties had to accede to this majority demand. President Premadasa also wanted to defuse the JVP situation. Anti-Indianism and the removal of the IPKF constituted the JVPs main platform; they managed to get the backing of a wide section of society by taking up the demand for the removal of the IPKF. Mr. Premadasa thought that the removal of the IPKF would either make the JVP give up the campaign or they will be weakened by the removal of this most popular issue. The removal of the IPKF was therefore necessary for the restoration of normalcy in the South. And let us remember that the JVP insurgency and not the LTTE was the main danger facing the country at that time. Even with the war we can have some normalcy, some development in the South: but with the JVP insurgency there was only anarchy and chaos. So that had to be handled first. After Mr. Premadasa became the President a private meeting was held with Anton Balasingham and Yogi at the Sucharitha Hall. This was just before the commencement of the public negotiations. The first meeting between the LTTE and the Sri Lankan government took place at the Hilton. I was a member of the SLG team. I remember that there was a pattern in these discussions; Balasingham used to remain silent while Dilip Yogi read out from a prepared statement about IPKF atrocities. The LTTE did not present any political demands. A. C. S. Hameed was our spokesman. The President told us in advance to let Hameed do all the talking. So this used to go on. After every round we were supposed to issue a joint communique. Hameed used to say that he will attend to that as well. He just monopolized everything. I remember Foreign Secretary W. T. Jayasinghe once told me: "Dont believe these people. They are trying a fast one". I told this to Mr. Premadasa. He said: "Sirisena this is the old way of looking at problems. Dont worry. I will settle everything". He was very confident that everything would work out in the end. Anyway I was not happy with the way the negotiations were progressing (or rather not progressing) and after the first two rounds I stayed away. Balasingham, Yogi and some of their people even visited the Mahiyangana Gam Udawa of 1989. Mr. Premadasa was thrilled about it. I took them around at Mr. Premadasas request and showed them all the development work we were doing. They seemed very impressed. I think what Mr. Premadasa was trying to do was to buy time. He was trying to keep the LTTE talking while slowly introducing reforms such as instituting the Pradesheeya Sabha system. That way the North and East would have had a group of elected leaders and it would have been possible to give the people everything they need for a decent standard of living - such as houses, electricity, water, jobs. This is what he meant when he said: "Eelam era Ellam kudutharei" (Not Eelam but everything else). He felt that once the basic needs of the people are looked after and they were given a measure of self government, Eelam would become irrelevant. The armed struggle would become unnecessary. The LTTE problem would be solved automatically, without having to wage a war. But for these reforms to work, peace on the ground and time were needed. So that was what he was trying to do with the negotiations. Unfortunately he underestimated the LTTE; I think they knew what he was trying to do and that was why they resumed hostilities unilaterally, despite all his attempts to prevent it. Mr. Premadasa was very upset when the war broke out. He felt that the LTTE had let him down. After hostilities broke out Mr. Premadasa came to the conclusion that a negotiated solution with the LTTE was not possible. I remember that when the Indians carried out the operation that killed Kittu, he was happy; we were in India at that time. But on the other hand he did not believe that the LTTE could be defeated military. Nor did he want to do so. He never believed in war and that was why he was unwilling to unleash the military on the JVP. I think that was a weakness on his part because as a Head of State he could not afford such an attitude. It was that attitude which killed him eventually. Because even after the resumption of hostilities he still believed that the LTTE would not do anything to him personally. After all he was willing to compromise and there was also his anti-Indianism. There are he tell that at a personal level the LTTE was no threat to him. He was wrong. Still during Mr. Premadasas time there were considerable successes on the military front. We cleared the whole of the Eastern province. The war was planned by the military. Mr. Premadasa was not interested in those plans and there was no political interference. He did not play politics with the war. The plan was to gradually move up, clearing one area after the other and finally take Jaffna. That way the LTTE could have been cornered with no place to retreat to. That was why we first cleared the Eastern Province and put the STF in charge. That way gradually the LTTE would have got bottled up in Jaffna. After that it would have been easy to defeat them. In the meantime we would carry out development work and political reforms in these areas, giving the people a decent standard of living and a measure of self-government. He also encouraged the strengthening of Tamil alternatives to the LTTE by providing assistance to and working closely with former Tamil militant groups that had entered the democratic process. Development and democracy - that was his plan. That way we would have been able to make the Tamil people give up their support for the LTTE and for Eelam. And that plan was working. We even managed to have local government elections in the East. There was a Presidential Mobile Service in Vavuniya. Several garment factories were in operation as part of the 200 Garment Factories Programme. It was also during this time that the Wanni service of the SLBC was inaugurated for our troops in the East. Immediately after an area is liberated we would move in and build houses for the people in the area. Initially Mr. Premadasa wanted 1000 houses to be built in 3 months in the liberated areas. By the time they were completed he was dead. I think in the last years Mr. Premadasas plans were falling into place and his strategy was beginning to work. That was probably why the LTTE expedited his killing. Under Mr. Premadasas leadership we were setting the pace. True many things were still undone. Everything cannot be done overnight. But more was accomplished in those four years than at any time before or after that. Of course there were mistakes. That was because so man new things were attempted. Sometimes you have to learn the best way of doing something new through trial and error. By the time of Mr. Premadasas death we had already learnt what went wrong and why. The best years were ahead. He would have been even better in the second term because we were in a position to learn from our mistakes and deliver the best. But his death deprived him, us and the country of that historic opportunity.